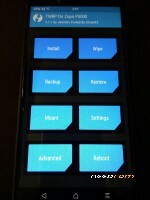 Twrp for Vernee X Pro(6gb) - X - Vernee - Powered by Discuz! Flag only the recovery and make download and now connect the usb cable with the device…take the button of volume + in the same time….when the progress of flash in flashtool start release the button level volume +…. Tap on Settings –> About phone –> Tap Build number seven times. Copy the recovery twrp in adb folder…. DO NOT USE FOR Vernee X (4GB) VERSION ! Would doing this void warranty? In every device all the operations to mod it will fall down the warrancy. Does it root the phone as well?What do you mean by '2)Change colors menu.'? i want to do this process, i have the vernee X 6 ram 128 Rom, can you be more explicit with images please.